Coming to Sapa, apart from its splendid landscapes, tourists will be attracted by Sapa’s specialties such as grilled salmon, barbecued wild pork, smoked pork and fried mushroom with meat as well as many tasty vegetarian dishes. Of course, grilled dishes are available everywhere, but enjoying that particular treat in the chill of the mountainous area and immense view of terraced rice fields and the magnificence of mountains and hills is an amazing experience. Grilled dishes in Sapa are simple affairs such as grilled corn, grilled sweet potato, eggs, and chestnut to many kinds of meat such as chicken, pork, salmon or beef. 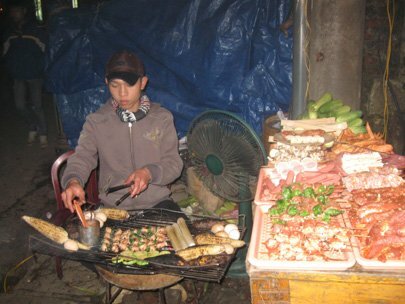 The ideal time to enjoy grilled dishes in Sapa is at nighttime when the town is blanked in mist, winds blow straight through tourists’ hair as they sit near to the fire stoves to rub their hands and warm their face. At that time, the fragrance from grills and seduction from the smoke will make diners lick their lips, along with the aroma of many indigenous vegetables. In the past, the grilled dishes in Sapa seemed to attract only local tourists but now it lures many foreigners. The business brings more financial benefit for ethnic people. 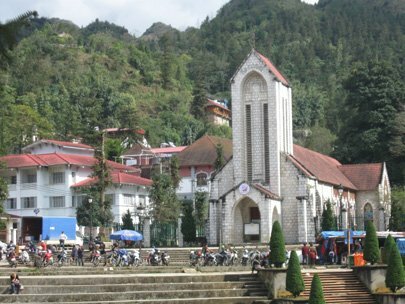 It is very easy to find grilled eateries in Sapa as there are hundreds of small restaurants from the church to Cong Doan Hotel and on the way to Ham Rong tourist area in Sapa Town.